Madonna's movie Swept Away has stolen the show at Hollywood's Golden Raspberry awards, or Razzies, for the worst films of the year. The desert island romance, starring Madonna and directed by her husband Guy Ritchie, took five Razzies on Saturday, including worst picture, worst actress and worst director. Madonna was not alone in her dishonour, sharing the worst actress title with fellow pop star Britney Spears for her screen debut Crossroads. Spears also grabbed the worst original song Razzie for I'm Not a Girl, Not Yet a Woman from the film, in which she plays an aspiring pop star. The Razzies, organised by the Golden Raspberry Award Foundation, are now in their 23rd year. They are traditionally announced a day before the Oscars, Hollywood's highest honours which are set for Sunday. Swept Away's five awards also included worst remake and worst screen couple for Madonna and her co-star Adriano Giannini. It also earned the distinction of being the Razzie's lowest-grossing worst film to date, having made $598,645 (£383,157) at the US box office. The film's poor performance in the US meant it never received a cinema release in the UK. But is was not just Swept Away that Madonna was lambasted for. Her cameo in the Bond movie Die Another Day also won her the worst supporting actress Razzie. Madonna now has five worst actress Razzies to her name and the title of worst actress of the 20th Century. Oscar-winning actor Robert Begnini did not escape the wrath of the voters either. The Italian actor/director was named worst actor for Pinocchio. 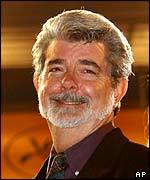 Star Wars director George Lucas was also singled out for the latest in the sci-fi series, Attack of the Clones. Its actor Hayden Christensen was top of the worst supporting male category while Lucas took the worst screenplay title for the film. The category of most flatulent teen-targeted movie went to Jackass: The Movie. The Golden Raspberry award is a handcrafted, golf-ball-sized raspberry on top of a mangled reel of film. It is spray-painted gold and has an estimated value of $4.89 (£3.12).